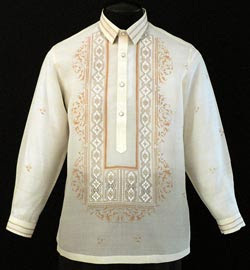 Philippines’ national dress, the Barong Tagalog enjoys a distinction all its own. Its fine needle or hand-painted designs in cool cotton or handwoven piña or jusi have given it a flair that has won international recognition and acceptance. President Ferdinand E. Marcos, who wore the Barong Tagalog with such impeccable grace and searing devotion, underscored its prestige when he issued in 1975 a decree proclaiming Barong Tagalog Week (June 5-11) and more significantly, officially designating the Barong Tagalog as “the national attire”. The presidential act was meant to focus nationwide attention on the Filipino national dress to promote its wider use and enhance its export potential. As it is, both the wide use and export potential of the Barong Tagalog have been explored, its full impact just a matter of time. What deserves another look is the manner the Filipino national costume has evolved and grown, picking up and shedding features fashion-related or otherwise, it its journey from pre-Hispanic native wear to national dress. But first, a few things have to be straightened out. Barong Tagalog is properly referred to as the Baro ng Tagalog (dress of Tagalog) and it cannot be contracted to simply Barong, one realizes, means “dress of”. If one wishes to shorten the phrase, then it would be Baro or “dress”. Yes, the Barong Tagalog is a dress, a garment, a coat in itself. It is not a “shirt”. If it were, then it would need a coat or jacket over it to qualify as formal wear and would have to be worn tucked inside the trousers. The earliest known fact on the Baro ng Tagalog discloses that the native of Ma-i (the Philippines as it was called before the Spaniards re-discovered the archipelago), and in particular, the Tagalogs, who lived in the island of Luzon, wore baro. The Tagalog males wore a sleeve-doublet of rough cotton cloth called canga, reaching slightly below the waist, collarless and with the opening in front. Depending on their social rank and badge of courage, the doublet was either red, black, blue or white (red for the chiefs and brave men, black or white for the ordinary citizens). Their loins were covered with a sort of colored pagne called bahague which hung between the legs to mid-thigh. The Tagalog women also wore a sleeve-dress of the same color as the men’s although their clothing was shorter than the men’s. too they wore a cotton pagne attached to the waist and reaching to the feet but a colored belt accented the grace and suppleness of their figures. 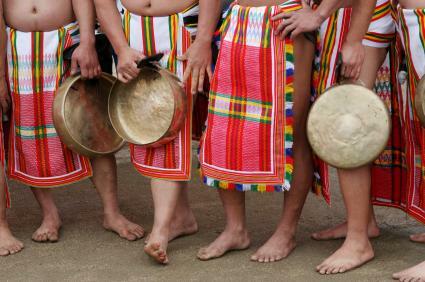 Other historical sources describe the personal attire of the Tagalog men, presumably those of the upper crust, as made of fine linen or Indian muslin which barely reached the waist. It was a short loose jacket (chamarreta) without collar and fitted with short sleeves. For breeches or pants, they wore “a richly colored cloth, which was generally edged with gold, about the waist and brought up between the legs, so that the legs were decently covered to the middle of the thigh from there down; feet and legs were bare. Called saluales, they were also worn loose and wide and made of linen. These were not open in front, but fastened on one side. A Franciscan friar, Fray San Francisco de San Antonio in his Cronicas added that the men’s baro was “loose to the wind, with wide sleeves and without cuffs.” For church functions and other official ceremonies, the chiefs and others wore a black woven smock reaching to their feet with sleeves fitted to the wrists over said clothes. They called this barong mahaba or long baro, a very modest and proper dress also worn loose. A little after the eighteenth century, the baro, as shortened and the Elizabethan collar was replaced by a short one, sans lace. The loose trousers were likewise changed. They became tight and adorned with big military stripes which were then in vogue. These loose trousers, however, made a comeback in 1750, this time, trimmed with laces or embroidered at the edges, a fashion that lasted till the first quarter of the 19th century. Moreover, it had not buttons and to fasten it around the waist, there were three openings, one in front and two at each side, with silk strings. During this period, the handkerchief, usually of colored silk and inspired by the European cravat, was introduced to go with the attire. By the 1840s the trousers that the Indios wore together with the baro assumed the shape and fit of real honest-to-goodness pants as they are known today. The men wore plain, long-sleeved loose shirt made of handwoven cotton, silk, sinamay, jusi and lupis. Interviews with some authorities on Philippine costume or fashion history yield the popular belief that the baro is not tucked in because it simply looks better it is tucked out. Aesthetically speaking, the baro with its loose style, handwoven embroidery and sheer fabric is for display, for exhibition. How in the world would the baro attain full radiance, so to speak, it if hides beneath pants and belts? Anyhow, the tradition of wearing the Barong Tagalog tucked out has been with us for centuries and Filipinos are not exactly anxious or even bothered about the rationale of such fashion style. In coat form, though of much cruder fabric and done less expertly, the coat-style baro was worn by the teniente del barrio or gobernadorcillo. Originally termed pinukpok, (perhaps because it was made of beaten abaca fibers called pinukpok), this coat-styled baro was long-sleeved.